My colleagues who have known me throughout my controversial military career and beyond, and who know in particular of my work on the antimalarial drug mefloquine (marketed in the US previously as Lariam), could be excused for assuming this was an early interest of mine. 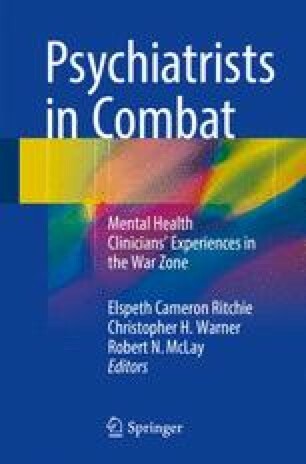 In fact, my work on the mental health effects of antimalarials began relatively late, and then initially only as an aspect of a much broader and newfound interest in public mental health that matured only during my first wartime deployment. I am frequently asked if there was a specific patient or patient experience during this deployment that led me to my work in these areas. I reply that to assume as much is to misunderstand the public mental health perspective. The practice of public mental health deemphasizes the significance of individual clinical anecdote for the subtler but vital truths found in the dry statistics describing the health of populations. To practice public mental health is to not miss the forest for the trees. Disclosures: Dr. Nevin receives consulting fees from attorneys representing clients alleging harm from their exposure to antimalarial drugs, including mefloquine, and has been retained as an expert witness in criminal and civil cases involving exposed civilians and military personnel. Johns Hopkins Bloomberg School of Public Health. Alumni profile: Remington L Nevin, MD, MPH’04. Baltimore, MD: Johns Hopkins Bloomberg School of Public Health; 2014. http://www.jhsph.edu/alumni/alumni-profiles/remington-nevin.html. Cave D. Army’s top recruiter says 2006 may be biggest test. New York Times; 2005. http://www.nytimes.com/2005/05/13/nyregion/armys-top-recruiter-says-2006-may-be-biggest-test.html. Miller TC, Zwerdling D. Military still failing to diagnose. Treat Brain Injuries: National Public Radio; 2010. http://www.npr.org/2010/06/08/127402993/military-still-failing-to-diagnose-treat-brain-injuries. Johns Hopkins Bloomberg School of Public Health. Keeping soldiers safe: Bloomberg School student’s research instigates military ban on malaria drug. Baltimore, MD: Johns Hopkins Bloomberg School of Public Health; 2013. http://www.jhsph.edu/news/stories/2013/student-remington-nevin-antimalarial-drug-research.html. United Press International. Report: U.S. military still using dangerous malaria drug. UPI.com 2013. Washington, DC: United Press International; 2013. http://www.upi.com/Health_News/2013/12/24/Report-US-military-still-using-dangerous-malaria-drug/UPI-27391387931392/.